Wall Street, Wall Street. Doesn't the world have enough to worry about? You can stop worrying about Apple. If you didn't know it before the company’s Sept. 12 hardware announcements, you should know now that Apple was not a one-man band before Steve Jobs died in 2011. It may have lost a little of Jobs’ showmanship, but Apple's powerhouse design teams are still hard at work – and doing just fine, thank you. To wit: The Apple design team significantly boosted pixels per inch (the specification that determines whether a display is marketed as a Retina display), resolution and screen area on the iPhone X compared to the iPhone 8 Plus. At the same time, Apple made the iPhone X's overall size almost 18% smaller than the 8 Plus. You don't make that kind of technological advance in opposing directions if you're just banging one out for the bottom line. While Samsung is hawking its latest smartphone as bigger and better, Apple is doing its level best to shrink the physical form factor to as close to the ideal – the iPhone 8 – as possible. This should come as no surprise. It was roughly around the time of the iPhone 5 that some Apple smartphone customers began agitating for iPhones with larger screens. The response from Apple was that it didn't want to build something that was wider than would be comfortable in the hands of its customers. The truth is, Apple has long preferred a smaller slimmer design for the iPhone. The appearance of the Plus-size models was Apple's way of segmenting the market, its acknowledgment that some people prefer larger displays on their smartphones. I am one of those people. For me, the 6S Plus, the phone I'm currently using, isn't wide enough. Although it’s a vast improvement over the 5/5S in size, both phones make me feel like I'm looking through a keyhole. Clearly, the 5 and 5S were even worse in this regard. The question I keep wondering is: Does the iPhone X effectively widen the iPhone's screen? It’s a complex little problem because Apple made numerous changes. Let's start with the physical. (I'm comparing sizes using millimeters because I think they are easier to understand than fractions or hundreds of an inch; for perspective, there are about 25mm in an inch.) The iPhone X is roughly 5 mm longer than the iPhone 8 and 15 mm shorter than the iPhone 8 Plus. The iPhone X is roughly 3.5 mm wider than the iPhone 8 and 7 mm narrower than the iPhone 8 Plus. So you can see, the iPhone X is physically much closer in size to the iPhone 8 than to the iPhone 8 Plus. What about the image area we gain by spreading the display side to side to the edge of the glass? Well, without an iPhone X or an iPhone 8 Plus in hand, there's no sure way to do that. But to approximate it, I measured the width of the non-display area on either side of my iPhone 6S Plus's screen. It’s at least 3mm on either side. That nets out to a 1mm deficit over the 8 Plus, which I think means that the effective width of the iPhone X screen will be equal to that of the iPhone 8 Plus and its recent predecessors. 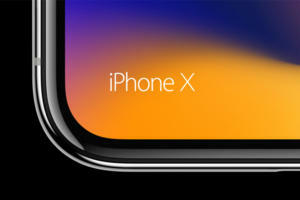 There's also the new "notch" at the top of the screen – and the related "ears" on each side, both of which have been criticized. While they're not ideal, when you add facial recognition to your phone with an infrared camera, dot projector, flood illuminator – and then you go edge to edge with the display – there are going to be some compromises. This is the way Apple chose to deal with the issue. It may be able to make this band of blackness smaller in the future or mount some of the hardware on the top edge. But right now, it’s more important to get the facial recognition right than it is to be too concerned about a small area where the picture doesn’t display. The other point to focus on is screen resolution. Apple has increased the iPhone X's screen resolution 32% compared to the iPhone 8 Plus. Part of that is due to the increased screen area, which I'll get to shortly. But in large measure, Apple simply decided to boost the screen resolution of the iPhone X. Theoretically that allows more picture to show (at a smaller size) – effectively "widening" the screen. However, anything that makes the picture show at a smaller size is negative in my book. I can't count it as widening the screen because it will only exacerbate the keyhole affect. Apple has clearly expanded the length of the screen. That could transform video viewing. The iPhone X may be 15mm shorter than the iPhone 8 Plus, but the top and bottom bars, where the speaker, camera and Home button appeared, measure almost 20mm each on the iPhone 6s Plus. That combined 40mm, minus 15mm, would put the display at roughly 25mm longer than that of the 8 Plus. It's not like Apple invented edge-to-edge display technology. Several other phone makers have done it. What is innovative is that Apple is doing it at the right time, using it to decrease the overall size of the device. For me, however, only a bigger screen will do. I plan to give the iPhone X a very close look when it arrives on Nov. 3. But I may well stick with my iPhone 6S Plus. If the new 8 Plus had facial recognition, I might be swayed to migrate to it. But there is a new drawback to consider: all that glass and stainless steel make the 8 Plus noticeably heavier than its predecessors. The numbers that have convinced me the most to stand pat are the ones with dollar signs in front of them: $950 for the 8 Plus and $1150 for the iPhone X (equipped as I would need them to be, with 256GB of RAM). Innovation, it seems, is costly. If the iPhone X's new design works for you, it's a price worth paying. If not, perhaps Apple will get it "right" on the next go around.